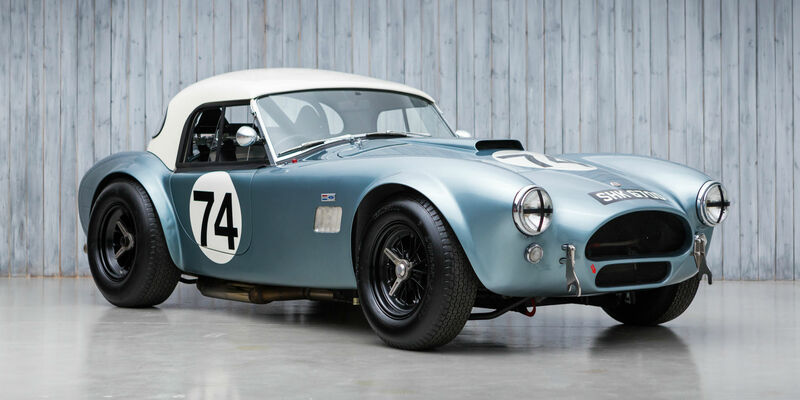 Regarded as one of the all-time great sports cars, the muscular, yet refined AC Cobra combined European chassis engineering and American V8 power in an what was to be become a legendary alliance, brought about Le Mans-winning racing driver Carroll Shelby, between AC Cars and the Ford Motor Company. 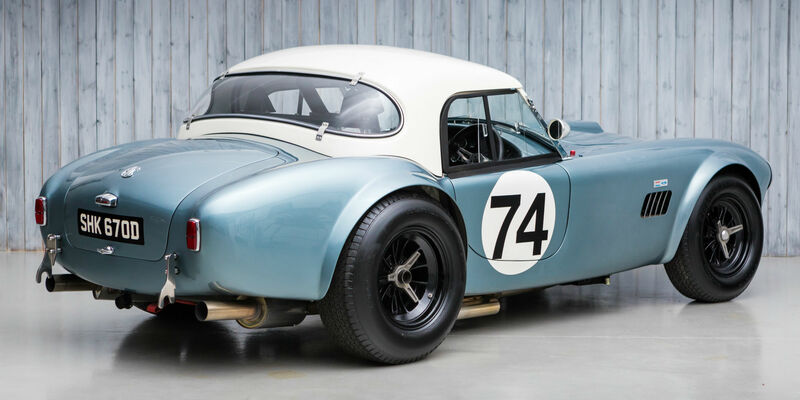 The former’s Ace provided the simple twin-tube chassis frame – strengthened and supplied with four-wheel disc brakes for the Cobra – into which was persuaded one of Ford’s lightweight, small-block V8s. The 260ci (4.2-litre) prototype first ran in January 1962, with production commencing later that year. 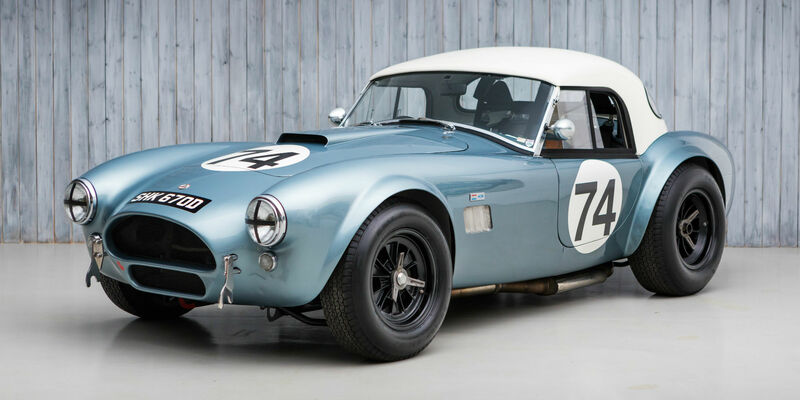 Exclusively for the USA initially, Cobras – minus engines – were sent from England to be finished off by Shelby in California, and it was not until late in 1963 that AC Cars in Thames Ditton got around to building the first fully finished European-specification cars. The Cobra was an instant success from the moment it hit the track, giving the might of Ferrari a run for its money. 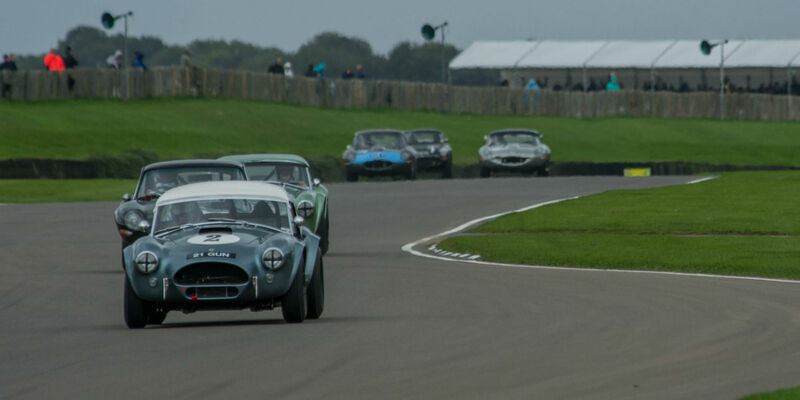 The Cobra went on to firmly secure it place in motor racing and sports car history and remains the weapon of choice for Historic GT racing to this day, with Cobras dominating events like the Goodwood Revival’s prestigious TT. COB 6044 is a UK supplied Mark II RHD 289, in Princess Alice Blue with red interior and was delivered to renowned AC dealer K.N. Rudd Ltd. of Worthing, Sussex on the 20th July 1965. The original green log book, which still accompanies the car today, shows that COB 6044 was first registered AKV 1 on the 14th June 1966 before being registered in the name of Mr. Clive Joseph of Chigwell, Essex on the 21st June 1966. Before Mr. Joseph sold COB 6044, the personalised registration AKV 1 was removed and SHK 670D took its place on 8th December 1966. Ownership passed to Mr. Thomas Cole of Harlow, Essex and COB 6044 was registered in his name on 19th December 1966. Thomas Cole owned the Cobra for three years, when on 23rd December 1969 the car was passed to Mr. Richard Cole of Wimbledon, SW19, London. A summarised service history accompanied it, on T.H. Cole headed paper and remains with COB 6044 to this day. This service history reports from 29260 miles back to 12,000 miles, showing professional and thorough maintenance throughout. 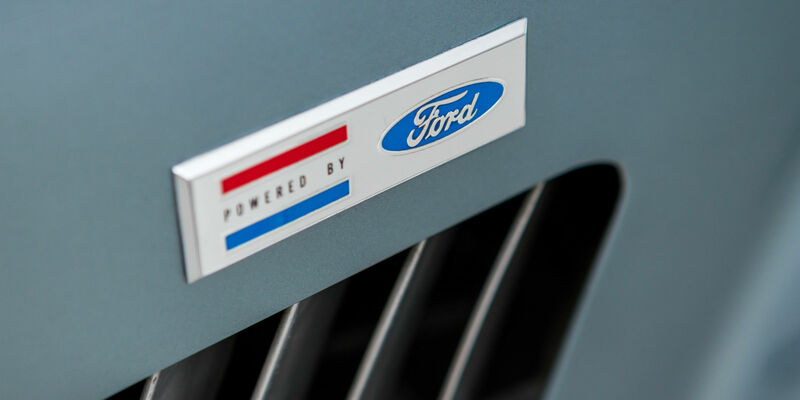 Importantly, it also describes how the chassis was regularly greased, which will have helped it remain in the good and original condition it is presented in today. 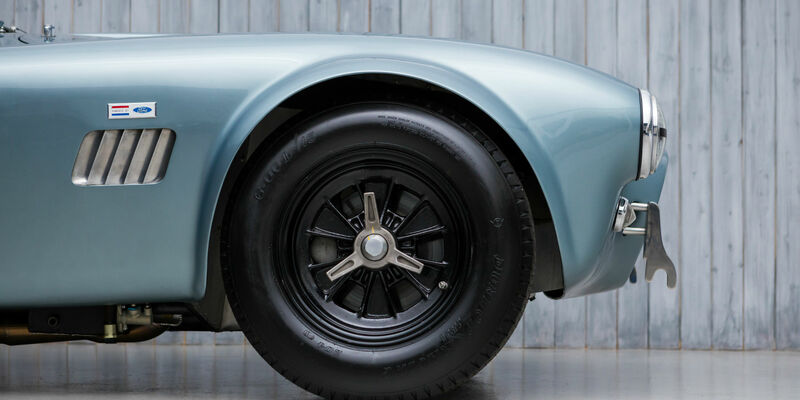 While in Richard Cole’s ownership of 6 years, COB 6044 was apparently repainted to be a “bright metallic blue”, according to the Shelby American World Registry. In August 1975, COB 6044 was bought by Mr. John Sewell of East Grinstead, Sussex. Several invoices from the 26 year tenure of Mr. Sewell again demonstrate how the Cobra was regularly professionally maintained and serviced. An October 1975 MOT invoice from Mann Egerton Ltd. shows COB 6044 as having covered 65,208 miles. 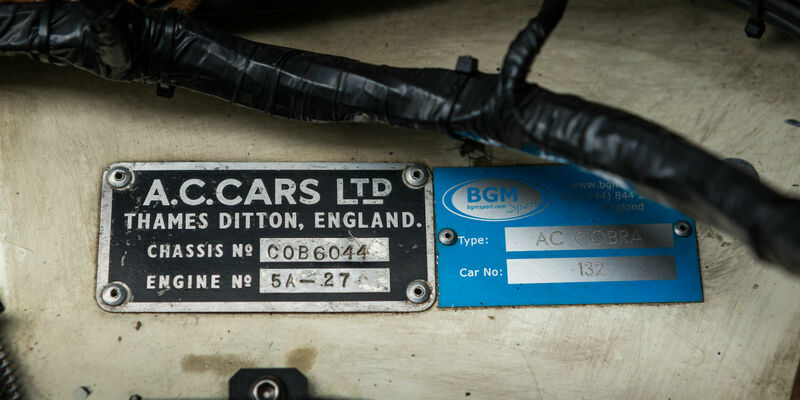 MOT certificates dating back to 1977 accompany COB 6044 today, and document the accumulation of mileage over the years. 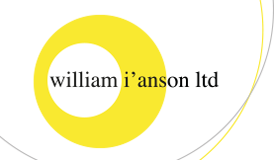 Letters between Mr. Sewell and John Atkins, ACOC Registrar of the time, in early 1986, describe Mr. Sewell’s interest in exercising the Cobra at one of the ACOC events in ’86. He describes COB 6044 as in original condition with the exception of the choke knob and uprated cooling fan, and also notes it’s condition as “in need of renovation”. Mr. Sewell continued using COB 6044 up to the point he sold it. At this time, 83,391 miles had been covered. COB 6044 was bought by well known Cobra racer Mr. William Bridges, of Walton-on-Thames, Surrey on 6th July 2001 from Mr. Sewell. 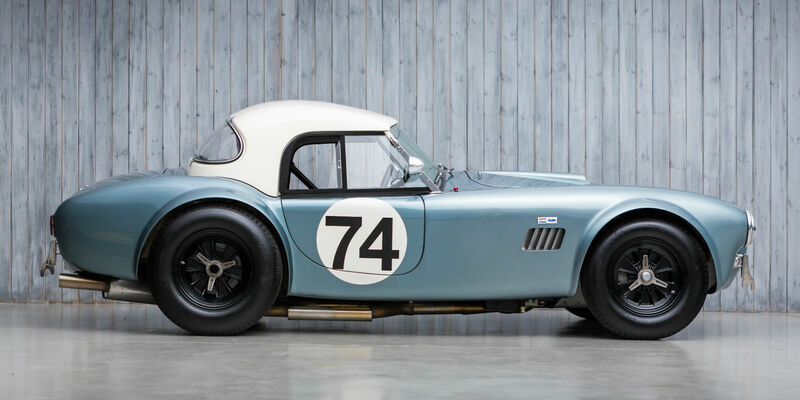 While in Bill Bridges’ ownership, the Cobra was prepared for historic racing. A removable roll hoop was added, suspension revised, and arches widened to accommodate the larger Halibrand wheels. COB 6044 was painted in pale yellow, similar to that of Bill Bridges’ other Cobra, the famous Hairy Canary. After racing the Cobra in the Le Mans Legends support race at the 2003 24 Hour meeting amongst others, ownership passed to Mr. John Andon of Guildford, Surrey on the 14th August 2003. While in Mr. Andon’s ownership, the registration SHK 670D was put on retention, and his personalised plate 2 JA was put on. In February 2005, Mr. Andon had work done on the body by the Brooklands Motor Company – a continuation of K.N. Rudd Ltd. 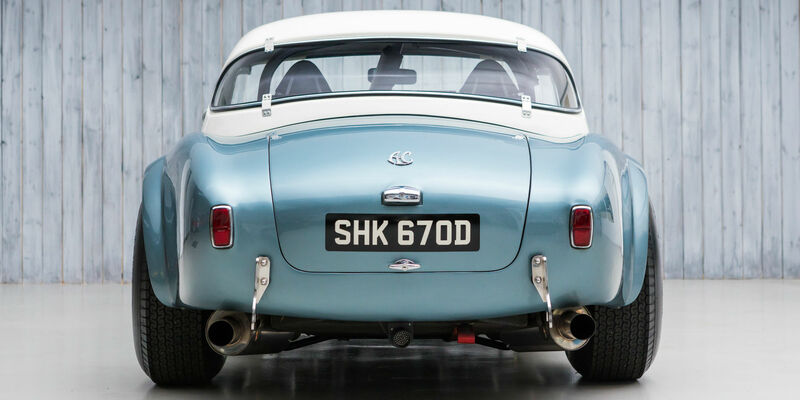 The wheel arches were again modified to their current state, and the aluminium was taken back to bare metal before being painted once more in the original colour, Princess Alice Blue. On the 23rd February 2006, COB 6044 was bought by Jonathan Bradburn of Stafford, Staffs. 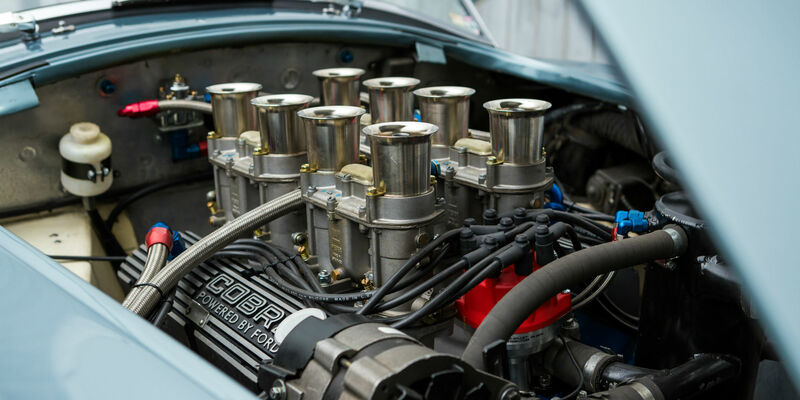 Mr. Bradburn had a high performance race engine built for the Cobra by Peter Knight in August 2006, at a total cost of £28,000. In October 2006, the Cobra went to Roger Dowson Engineering, where they reported on the condition of the car. Over the next 8 months, the car was gone through, refreshed and prepared for competition with nearly £25,000 being spent. New FIA HTPs for COB 6044 were applied for, and were granted in January 2007. Despite obtaining the new HTPs fitting the race engine, and the preparation, Mr. Bradburn never actually raced COB 6044. In June 2010, COB 6044 was bought by the Geoff Lister. 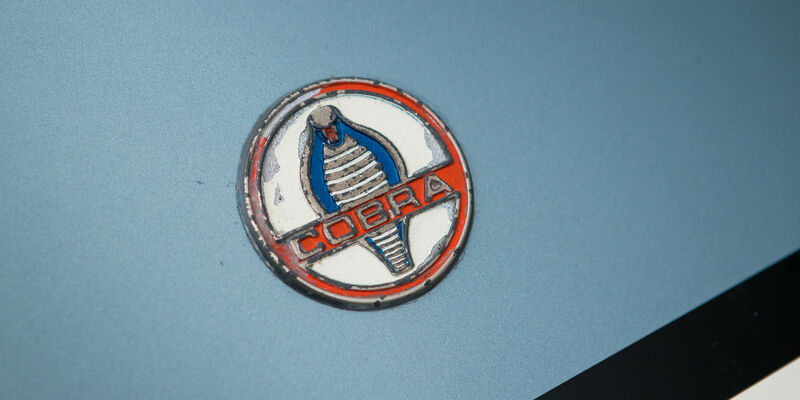 During his ownership, the Cobra was used sparingly, while always being professionally maintained. In July 2011, RW Racing Services looked over the car for Mr. Lister and advised of work to the exhaust system and wiring loom. In June 2013, the Cobra was with Ed Watson & Co for its MOT and some minor service work. The Cobra then returned to Ed Watson & Co during 2014 where several jobs were undertaken, including having a new stainless steel exhaust system made and a total re-wire to the sum of just short of £10,000. Part of this work involved fitting a new speedometer to replace the original, which had stopped working. The original Smiths speedometer still accompanies COB 6044 and reads 86,102 miles. The current owner bought COB 6044 from Mr. Lister in 2016. In his ownership, the Cobra has been gone through and developed by BGMSport to bring it up to very competitive racing specification. A new Peter Knight engine was fitted with a new stainless exhaust, new gearbox and new differential. The dampers were replaced for Konis and set-up work was undertaken. Extensive testing was then conducted with both the owner and Sam Hancock behind the wheel, producing a best lap time of 1:26.7 at Goodwood. Along with this work, a removable roll cage was constructed and a lightweight roof was fitted. New FIA HTPs were obtained in 2017 and accompany the Cobra. 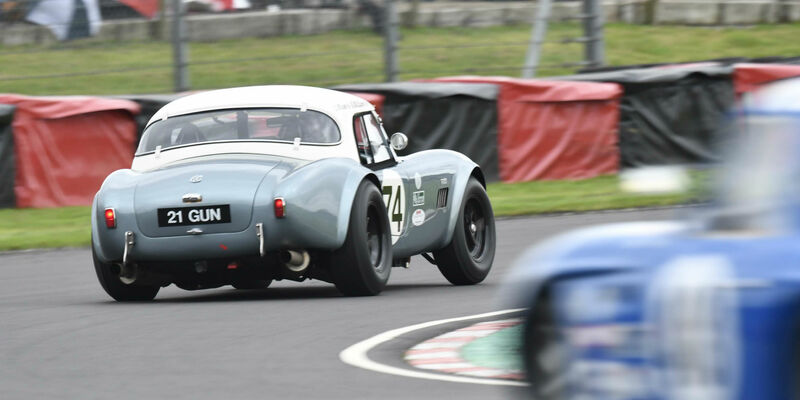 The Cobra has been raced with the GT and Sports Car Cup at Silverstone finishing 7th and Castle Combe finishing 6th. COB 6044 has also competed in possibly the most important race of historic motorsport, the RAC TT at the Goodwood Revival in 2017. After subsequently completing more testing, COB 6044’s engine has been refreshed and currently has 0 hours running time on it, and only testing time on the gearbox. A total in excess of £200,000 has been spent in the running and development of COB 6044 in the current ownership, giving an indication to the standard of preparation which is present. COB 6044 is accompanied today by an extensive history file, with service history back to 12,000 miles, several invoices back to 1976 and MOT certificates back to 1977, along with the original green log book. The Cobra also comes with a small spares package which includes another set of Halibrand wheels and removable single roll hoop. 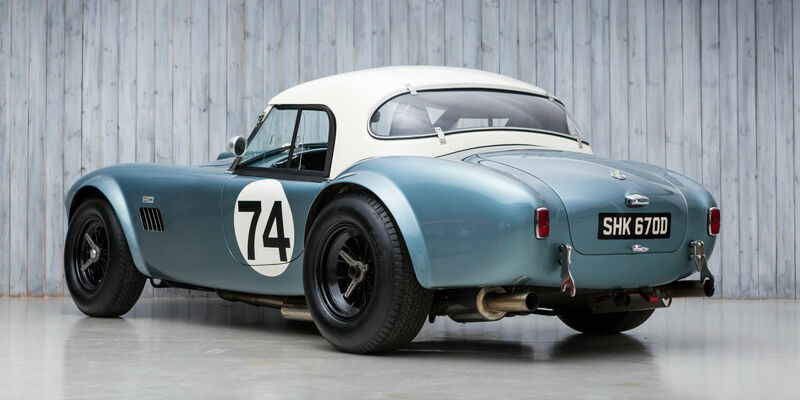 With a clear, no questions history confirmed by the ACOC, COB 6044 offers the rare opportunity to acquire a Cobra, prepared to current competitive racing specification while still retaining its all important originality. 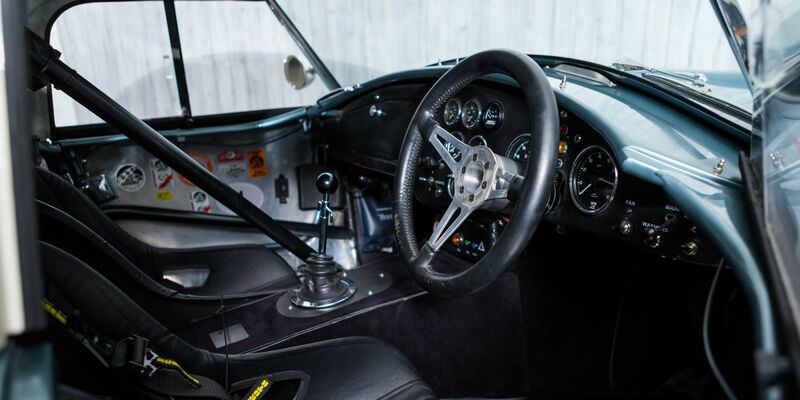 Fast exciting and a pleasure to drive, this is a desirable entry to the prestigious selection of tours, rallies, and races worldwide such as the Tour Auto, Goodwood Revival, Masters Gentleman Drivers’, GTSCC, and Peter Auto’s 60s Endurance to name but a few. 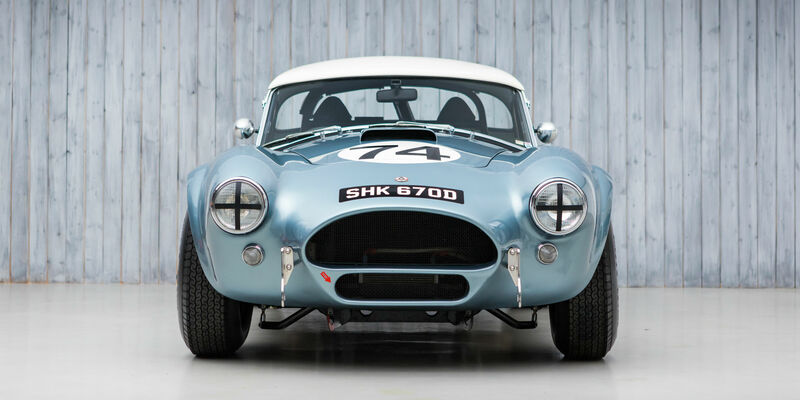 With a clear, no questions, continuous history from new, confirmed by the ACOC; COB 6044 offers the rare opportunity to acquire a genuine Cobra prepared to current competitive racing specification while still retaining its all important originality. Consigned to K.N. Rudd Ltd. of Byfleet in 1965, it still bears the registration SHK 670D which it has worn since 1966. Maintained professionally from new, and initially prepared for historic racing within the last 15 years by well known Cobra racer Bill Bridges. Recently developed by BGMSport and fitted with a 0 hours top specification Peter Knight engine. Invoices totalling in excess of £200k give an indication of the level to which COB 6044 has been prepared. Tested by Sam Hancock, a lap time of 1:26.7 has been achieved at Goodwood. A veteran of the RAC TT at the Goodwood Revival, Le Mans Legends, Tour Auto, Goodwood Festival of Speed, and the Spa 6 Hours meeting to name but a few, COB 6044 is a wonderful Gentleman Drivers’ car which is eligible for a huge variety of exciting road, rally, and race events across the globe. Accompanied by an extensive history file with the original green log book, service history back to 12,000 miles, invoices back to 1976 and MOT certificates back to 1977. Also present are a another set of Halibrand wheels, and removable single roll hoop.